The government is considering operating F-35B fighter jets from about fiscal 2026, in an effort to utilize airports on remote islands and thereby improve the nation's capability to defend the isles, The Yomiuri Shimbun has learned. Considered the most advanced stealth fighters, F-35Bs are currently operated by the U.S. military based in Japan. The Japanese government is also eyeing the operation of the fighters on Izumo, the Maritime Self-Defense Force's largest-class destroyer and which Tokyo is considering remodeling into an aircraft carrier, according to government sources. The government has decided to introduce 42 F-35A fighter jets -- which are capable of taking off and landing on ordinary runways -- as a successor to aging F-4 fighters. The first F-35A was deployed at the Air Self-Defense Force's Misawa Air Base in Aomori Prefecture last month. As for the F-35B, the government is planning to indicate the number of aircraft to be procured in the next Medium Term Defense Program, which is to be compiled at the end of this year. It is also mulling including related expenses in the fiscal 2019 budget plan, with a view to starting the delivery of F-35Bs from around fiscal 2024, the sources said. The F-35B is likely to be defined as a successor to the F-15, the ASDF's main fighter jet. One plan is to introduce about 20 to 40 F-35Bs, which would correspond to one to two squadrons. 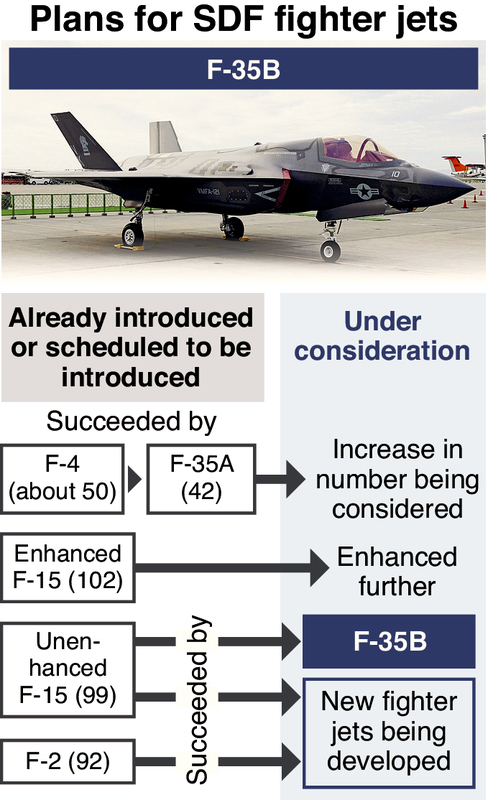 Tokyo is also considering increasing the number of F-35As in the next midterm defense program, according to the sources. The introduction of F-35Bs would facilitate the use of commercial airports on remote islands. The minimum runway length required for the advanced fighter to take off is relatively short, making it more likely to be able to actually take off even when the airstrip at its home base is under attack. The government is considering highlighting the objective of strengthening the capability for continuous combat operations in the National Defense Program Guidelines, which is expected to be reviewed at the year end. The ASDF's Nyutabaru Air Base in Shintomi, Miyazaki Prefecture, is named as a possible base for the F-35B to be deployed. The government is also eyeing converting Izumo into an aircraft carrier -- which fighter jets can take off from and land on -- by reinforcing the heat resistance of the ship's deck. It aims to begin operation of the aircraft carrier in the early 2020s. Starting this fiscal year, the MSDF has commissioned a shipbuilding company to carry out a study on enhancing the Izumo's aircraft operation capability. Defense Minister Itsunori Onodera suggested at a meeting of the House of Representatives Budget Committee on Thursday that the government is considering operating the F-35B. The study on Izumo is being carried out "with the recently developed aircraft in mind," the minister said. The converted Izumo is planned to be utilized for such purposes as a supply base to defend remote islands. For the time being, the government wants the U.S. military to operate the F-35B, but it also plans to eventually operate the advanced fighter on its own by learning operational know-how from the U.S. side regarding the takeoff and landing of fighter jets, according to the sources. There are 201 F-15 fighter jets -- which were first introduced in fiscal 1980 -- currently being deployed. Of them, 102 will continue to be enhanced and used in the future by installing them with such equipment as new types of electronic devices. The remaining 99, without being enhanced, are expected to be replaced with F-35Bs as well as a successor fighter to the F-2, the sources said.